Here’s my promise. 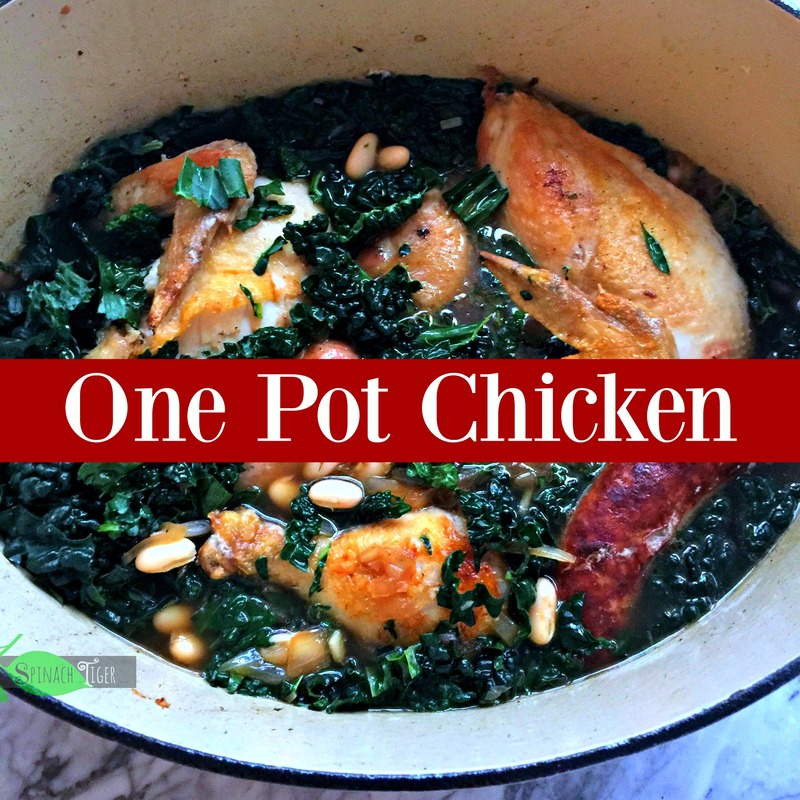 If you make this easy one pot chicken recipe with sausage beans and greens dish, you will make it again, probably a week later. It has a flavor profile that just pulls you in and says life is worth living, if just for this one bite of food. If you want an absolutely delicious, easy, hearty, soul-warming winter meal all made in one pot, this is that dish. This is cassoulet inspired but it’s not cassoulet, which is a much more complicated recipe, like this one, which one day, I aim to make. There’s nothing new here from a culinary viewpoint. People cook chicken with sausage all the time. They add beans. They add greens. Millions of dishes contain such ingredients. What I think I’m doing for you is simplifying a dish and promising some complex flavors, in a very easy way. You really don’t have to know how to cook to make this, and people will think you are amazing. Simply buy a good store bought broth. Sure you could make your own stock with this recipe, but sometimes there’s no time for that. I used Whole Foods organic chicken broth. If you use a store bought bone broth, be careful of too many additional flavors. The cleaner the broth flavor, the better. Use Bratwurst if you can. Brats originated in Germany and made typically with veal, pork, ginger, coriander and caraway and nutmeg. I can’t know for sure if the brats I used from Whole Foods had all of these ingredients, but I do know they had a very specific flavor profile that other sausage doesn’t and it made the dish just right. While I love Italian sausage, it will have fennel and be a different (although still good) flavor. Use a mix of chicken. It just makes everyone happy. You can use just thighs, but don’t use only white meat. I’m frugal (sometimes) and I always buy a whole chicken and cut it up and use what I need and freeze the rest. Deeply brown your chicken. Be patient. Use a lot of chopped onion. It does something to the kale. Use lacinato kale if you can. It’s better than curly kale for a lot of reasons. Remove the ribs. If you’re aren’t going to take the time to remove the ribs, use curly kale. 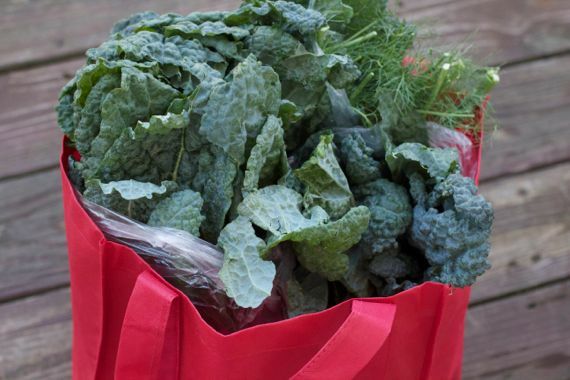 You’ll note that I have about 25 kale recipes here, and the possibilities are never ending. 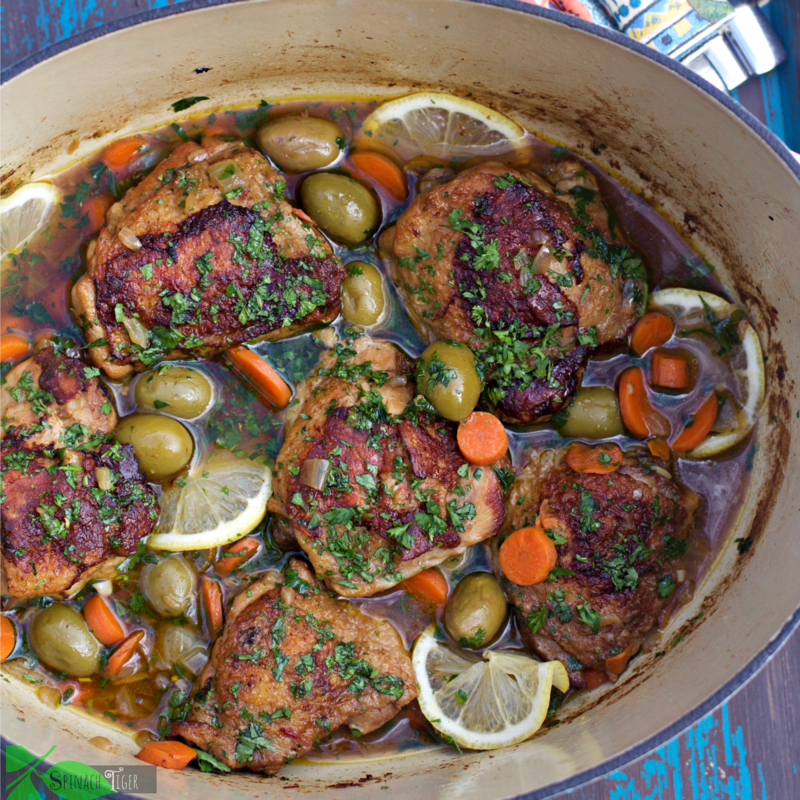 I like to make my one pot chicken recipes in an enameled cast iron dutch ovens. This 7-quart oval dutch oven is my most recent favorite from Lodge. This 6-quart dutch oven one from Martha Stewart is one I’ve used countless times. 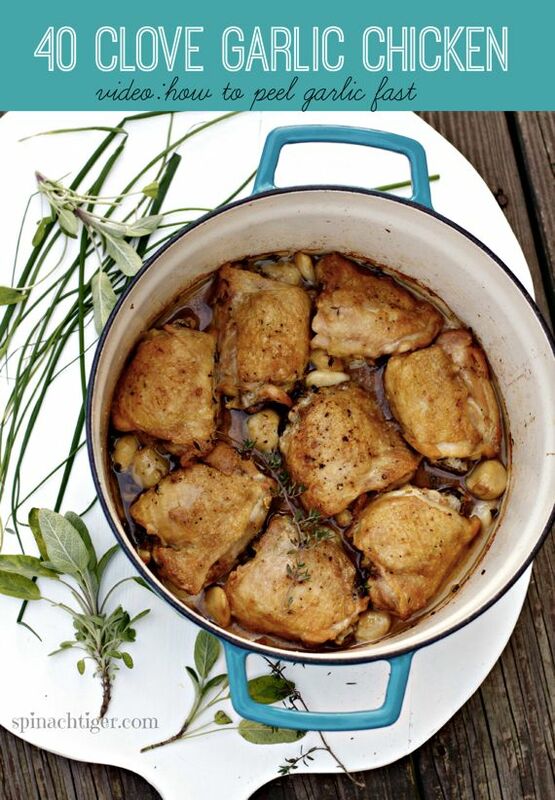 One Pot Chicken Recipe, Chicken with 40 Garlic Cloves of Garlic is a classic. 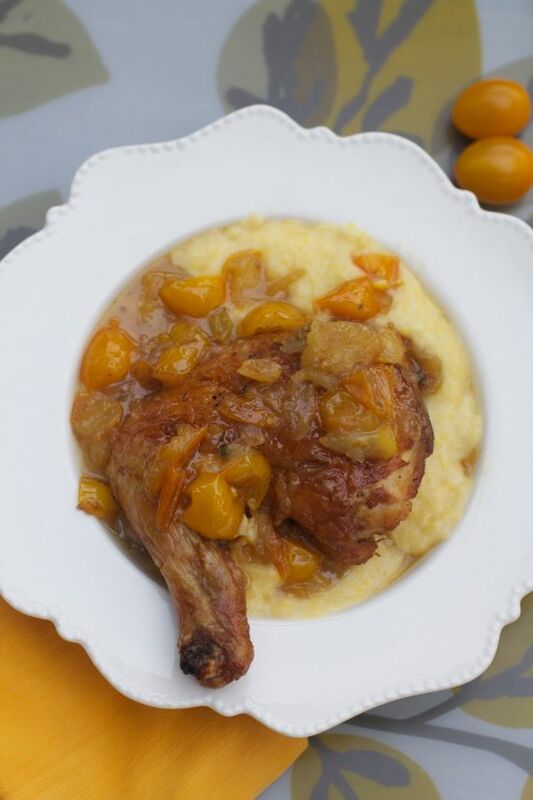 One Pot Chicken: Chicken Agridolce (This is sweet and sour, Italian style). I hope you enjoy your one pot cooking. I’ll be back with more. A very easy one pot dish of chicken, sausage, kale and beans, hearty, healthy, and full of flavor. Put oil in frying pan or dutch oven. Once oil is hot, brown chicken on both sides. Brown deeply. This can take 8 minutes a side. You can dredge chicken in flour if you desire; it's not necessary. Once chicken is deeply browned, remove from pan. Add in sausage and brown on all sides. Remove. Add meat back in to pot. Rinse beans in water to remove sodium. Cook on very for two to three hours or add to crock pot on very low. During the last hour of cooking, add chopped kale. To prepare kale, cut out middle ribs and chop. If using curly kale, cut out any large ribs and chop. Once the kale is melted into the broth which can take up to 30 minutes, the dish is done. I cut up a whole chicken, but only used one thigh/leg and 2 chicken breasts with wings attached. You can mix it anyway you prefer, even using all thighs. thank you so much. I use my spiralizer at least weekly also. looks AWSOME! Cant wait to try it!